First, I want to welcome my new followers! It truly makes my day when I get new followers. I'm excited to announce that I have seven confirmed projects for my 25 Days of Handmade Christmas series! With a few more possibilities. If you're interested in joining, click here for more details. Since day one was used to get the series up and running, there will be one day with two tutorials so that I get in the full 25 projects. Until then, here is the project for day two. 1. I was being extremely lazy while creating this craft. I was sitting in the living room, watching tv, in my sweats, in a big comfy chair. The lighting is bad, and my workspace isn't pretty. 3. 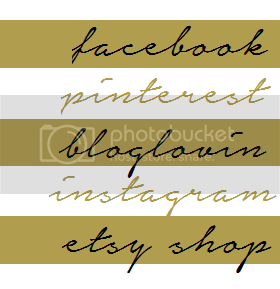 While editing my photos (which I just learned photobucket allows you to do! ), the uploading wasn't working properly. I attempted to upload edited photos and the originals would upload instead. Sometimes when I view the page they look fine and other times they look awful. Not sure what's going on, but I apologize if you encounter some funky photos. Ok, now that I've got all of that out of the way, here's my tutorial! Styrafoam cone forms. You can use as many or as few as you'd like and whatever sizes you prefer. I used three of varying sizes. 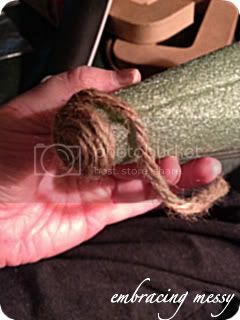 Jute (or yarn). The roll I purchased was 125 ft which left me with some extra. 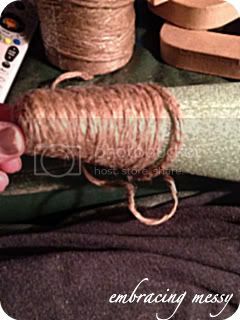 Step 1: Since my cone forms had a flat top, I began by rolling the jute to look like this and then placing a dab of glue on the top of the cone to secure it. 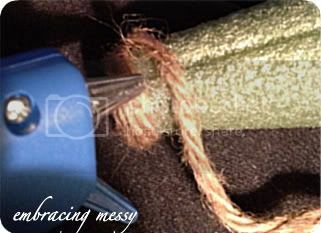 Step 2: Continue to wrap the jute (or yarn) around the form, placing a dab of glue here and there to secure it. As I got to the last couple of rows, I used a lot more glue to make sure that it was extra secure. 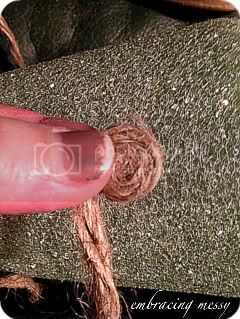 Step 3: Cut out a round piece of felt and secure to the bottom of the tree. This keeps the ugly green pieces from flaking off of the styrafoam and getting everywhere. Step 4: Decorate! I used poinsetta flowers on mine which easily stuck into the styrafoam. 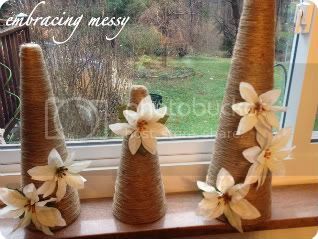 This is perfect for the huge roll of leftover sisal I have from making garland for our tree! Found you on Freestyle Friday!